Another method of classifying industries is on the basis of raw materials used by them. Accordingly, these can be : (i) agriculturebased industries, (ii) forest-based industries, (iii) mineral-based industries, and (iv) industrially processed raw materialbased industries. Another common classification of industries is based on the nature of the manufactured products. Eight classes of industries, thus identified are : (1) Metallurgical Industries, (2) Mechanical Engineering Industries, (3) Chemical and Allied Industries, (4) Textile Industries, (5) Food Processing Industries, (6) Electricity Generation, (7) Electronics and (8) Communication Industries. India, being a democratic country aims at bringing about economic growth with balanced regional development. Establishment of iron and steel industry in Bhilai and Rourkela were based on decision to develop backward tribal areas of the country. At present, government of India provides lots of incentives to industries locating in backward areas. The development of the iron and steel industry opened the doors to rapid industrial development in India. Almost all sectors of the Indian industry depend heavily on the iron and steel industry for their basic infrastructure. The other raw materials besides iron ore and coking coal, essential for iron and steel industry are limestone, dolomite, manganese and fire clay. All these raw materials are gross (weight losing), therefore, the best location for the iron and steel plants is near the source of raw materials. In India, there is a crescent shaped region comprising parts of Chhattisgarh, Northern Orissa, Jharkhand and western West Bengal, which is extremely rich in high grade iron ore, good quality coking coal and other supplementing raw materials. The Indian iron and steel industry consists of large integrated steel plants as well as mini steel mills. It also includes secondary producers, rolling mills and ancillary industries. TISCO : The Tata Iron and Steel plant lies very close to the Mumbai-Kolkata railway line and about 240 km away from Kolkata, which is the nearest port for the export of steel. The rivers Subarnarekha and Kharkai provide water to the plant. The iron ore for the plant is obtained from Noamundi and Badam Pahar and coal is brought from Joda mines in Orissa. Coking coal comes from Jharia and west Bokaro coalfields. The third integrated steel plant, the Visvesvaraiya Iron and Steel Works, initially called the Mysore Iron and Steel Works, is located close to an iron ore producing area of Kemangundi in the Bababudan hills. Limestone and manganese are also locally available. But this region has no coal. At the beginning, charcoal obtained by burning wood from nearby forests was used as fuel till 1951. Afterwards, electric furnaces were installed which use hydroelectricity from the Jog Falls hydel power project. The Bhadravati river supplies water to the plant. This plant produces specialised steels and alloys. Rourkela Steel Plant : The Rourkela Steel plant was set up in 1959 in the Sundargarh district of Orissa in collaboration with Germany. The plant was located on the basis of proximity to raw materials, thus, minimising the cost of transporting weight losing raw material. This plant has a unique locational advantage, as it receives coal from Jharia (Jharkhand) and iron ore from Sundargarh and Kendujhar. The Hirakud project supplies power for the electric furnaces and water is obtained from the Koel and Sankh rivers. Bhilai Steel Plant : The Bhilai Steel Plant was established with Russian collaboration in Durg District of Chhattisgarh and started production in 1959. The iron ore comes from Dalli-Rajhara mine, coal comes from Korba and Kargali coal fields. The water comes from the Tanduladam and the power from the Korba Themal Power Station. This plant also lies on the Kolkata-Mumbai railway route. The bulk of the steel produced goes to the Hindustan Shipyard at Vishakhapatnam. Durgapur Steel Plant : Durgapur Steel Plant, in West Bengal, was set up in collaboration with the government of the United Kingdom and started production in 1962. This plant lies in Raniganj and Jharia coal belt and gets iron ore from Noamundi Durgapur lies on the main Kolkata-Delhi railway route. Hydel power and water is obtained from the Damodar Valley Corporation (DVC). Bokaro Steel Plant : This steel plant was set up in 1964 at Bokaro with Russian collaboration. This plant was set up on the principle of transportation cost minimisation by creating Bokaro-Rourkela combine. It receives iron ore from the Rourkela region and the wagons on return take coal to Rourkela. Other raw materials come to Bokaro from within a radius of about 350 km. Water and Hydel power is supplied by the Damodar Valley Corporation. New steel plants which were set up in the Fourth Plan period are away from the main raw material sources. All the three plants are located in South India. The Vizag Steel Plant, in Vishakhapatnam in Andhra Pradesh is the first port based plant which started operating in 1992. Its port location is of advantage. The Vijaynagar Steel Plant at Hospet in Karnataka was developed using indigenous technology. This uses local iron ore and limestone. The Salem Steel Plant in Tamil Nadu was commissioned in 1982. Apart from these major steel plants, there are more than 206 units located in different parts of the country. Most of these use scrap iron as their main raw material, and process it in electric furnaces. The Cotton Textile Industry : The cotton textile industry is one of the traditional industries of India. In the ancient and the medieval times, it used to be only a cottage industry. India was famous worldwide for the production of muslin, a very fine variety of cotton cloth. The development of this industry in India was due to several factors. One, it is a tropical country and cotton is the most comfortable fabric for a hot and humid climate. Second, large quantity of cotton was grown in India. Abundant skilled labour required for this industry was available in this country. In fact, in some areas the people were producing cotton textiles for generations and transferred the skill from one generation to the other and in the process perfected their skills. Initially, the British did not encourage the development of the indigenous cotton textile industry. They exported raw cotton to their mills in Manchester and Liverpool and brought back the finished products to be sold in India. This cloth was cheaper because it was produced at mass scale in factories in U.K. as compared to the cottage based industries of India. In 1854, the first modern cotton mill was established in Mumbai. This city had several advantages as a cotton textile manufacturing centre. It was very close to the cotton producing areas of Gujarat and Maharashtra. Subsequently, two more mills, the Shahpur Mill and the Calico Mill were established in Ahmedabad. By 1947, the number of mills in India went up to 423 but the scenario changed after partition, and this industry suffered a major recession. This was due to the fact that the most of the good quality cotton growing areas had gone to West Pakistan and India was left with 409 mills and only 29 per cent of the cotton producing area. After Independence, this industry gradually recovered and eventually flourished. The cotton textile industry in India can be broadly divided into two sectors, the organised sector and the unorganised sector. 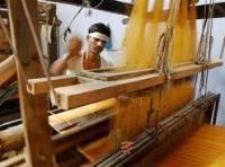 The decentralised sector includes cloth produced in handlooms (including Khadi) and powerlooms. The production of the organised sector has drastically fallen from 81 per cent in the mid-twentieth century to only about 6 percent in 2000. At present, the powerlooms on the decentralised sector produce more than 59 per cent and the handloom sector produces about 19 per cent of all cotton cloth produced in the country. Cotton is a “pure” raw material which does not lose weight in the manufacturing process. so other factors, like, power to drive the looms, labour, capital or market may determine the location of the industry. At present the trend is to locate the industry at or close to markets, as it is the market that decides what kind of cloth is to be produced. Sugar Industry : The sugar industry is the second most important agro-based industry in the country. India is the largest producer of both sugarcane and cane sugar and contributes about 8 per cent of the total sugar production in the world. Besides, khandasari and gur or jaggery are also prepared from sugarcane. This industry provides employment for more than 4 lakh persons directly and a large number of farmers indirectly. Sugar industry is a seasonal industry because of the seasonality of raw materials. Development of the industry on modern lines dates back to 1903, when a sugar mill was started in Bihar. Location of the Sugar Industry : Sugarcane is a weight-losing crop. The ratio of sugar to sugarcane varies between 9 to 12 per cent depending on its variety. Its sucrose content begins to dry during haulage after it has been harvested from the field. Better recovery of sugar is dependent upon its being crushed within 24 hours of its harvesting. Sugar factories hence, are located within the cane producing regions. Maharashtra has emerged as a leading sugar producer in the country and produces more than one-third of the total production of the sugar in the country. Uttar Pradesh is the second largest producer of sugar. Petrochemical Industries : This group of industries has been growing very fast in India. A variety of products come under this category of industries. In 1960s, demand for organic chemicals increased so fast that it became difficult to meet this demand. At that time, petroleum refining industry expanded rapidly. Many items are derived from crude petroleum, which provide raw materials for many new industries, these are collectively known as petrochemical industries. This group of industries is divided into four sub-groups: (i) polymers, (ii) synthetic fibres, (iii) elastomers, and (iv) surfactant intermediate. Mumbai is the hub of the petrochemical industries. Three organisations are working in the petrochemical sector under the administrative control of the Department of Chemicals and Petrochemicals. First is the Indian Petrochemical Corporation Limited (IPCL), a public sector undertaking. It is responsible for the manufacture and distribution of the various petrochemicals like polymers, chemicals, fibres and fibre intermediates. Second is the Petrofils Cooperative Limited (PCL), a joint venture of the Government of India and Weaver’s Cooperative Societies. It produces polyester filament yarn and nylon chips at its two plants located at Vadodara and Naldhari in Gujarat. Third is the Central Institute of Plastic Engineering and Technology (CIPET), involved in imparting training in petro-chemical industry. Polymers are made from ethylene and propylene. These materials are obtained in the process of refining crude oil. Polymers are used as raw materials in the plastic industry. Among polymers, polyethylene is a widely used thermoplastic. Plastic is first converted into sheets, powder, resin and pellets, and then used in manufacturing plastic products. Plastic products are preferred because of their strength, flexibility, water and chemical resistance and low prices. The advancement in information technology has had a profound influence on the country’s economy. The Information Technology (IT) revolution opened up new possibilities of economic and social transformation. The IT and IT enabled business process outsourcing (ITESBPO) services continue to be on a robust growth path. Indian software industry has emerged as one of the fastest growing sectors in the economy. India’s software industry has achieved a remarkable distinction for providing quality products. A large number of Indian software companies have acquired international quality certification. A majority of the multinational companies operating in the area of information technology have either software development centres or research development centres in India. However, in the hardware development sector, India is yet to make any remarkable achievements. The new Industrial Policy was announced in 1991. The major objectives of this policy were to build on the gains already made, correct the distortions or weaknesses that have crept in, maintain a sustained growth in productivity and gainful employment and attain international competitiveness. Within this policy, measures initiated are : (1) abolition of industrial licensing, (2) free entry to foreign technology, (3) foreign investment policy, (4) access to capital market, (5) open trade, (6) abolition of phased manufacturing programme, and (7) liberalised industrial location programme. The policy has three main dimensions: liberalisation, privatisation and globalisation. The industrial licensing system has been abolished for all except six industries related to security, strategic or environmental concerns. At the same time, the number of industries reserved for public sector since 1956 have been reduced from 17 to 4. Industries related to atomic energy, substances specified in the Schedule of the Department of Atomic Energy as well as Railways have remained under the public sector. The government also has decided to offer a part of the shareholdings in the public enterprises to financial institutions, general public and workers. The threshold limits of assets have been scrapped and no industry requires prior approval for investing in the delicensed sector. They only need to submit a memorandum in the prescribed format. In the new industrial policy, Foreign Direct Investment (FDI) has been seen as a supplement to the domestic investment for achieving a higher level of economic development. FDI benefits the domestic industry as well as the consumers by providing technological upgradation, access to global managerial skills and practices, optimum use of natural and human resources, etc. Keeping all this in mind, foreign investment has been liberalised and the government has permitted access to an automatic route for Foreign Direct Investment. The government has also announced changes in the industrial location policies. Industries are discouraged in or very close to large cities due to environmental reasons. The industrial policy has been liberalised to attract private investor both domestic and multi-nationals. New sectors like, mining, telecommunications, highway construction and management have been thrown open to private companies. In spite of all these concessions, Foreign Direct Investment has not been up to the expectation. There has been a big gap between approved and actual foreign direct investment, even though the numbers of foreign collaborations are increasing. Larger parts of this investment have gone to domestic appliances, finance, services, electronics and electrical equipment, and food and dairy products. Globalisation means integrating the economy of the country with the world economy. Under this process, goods and services along with capital, labour and resources can move freely from one nation to another. The thrust of globalisation has been to increase the domestic and external competition through extensive application of market mechanism and facilitating dynamic relationship with the foreign investors and suppliers of technology. In Indian context, this implies: (1) opening of the economy to foreign direct investment by providing facilities to foreign companies to invest in different fields of economies activity in India; (2) removing restrictions and obstacles to the entry of multinational companies in India; (3) allowing Indian companies to enter into foreign collaboration in India and also encouraging them to set up joint ventures abroad; (4) carrying out massive import liberalisation programmes by switching over from quantitative restrictions to tariffs in the first place, and then bringing down the level of import duties considerably; and (5) instead of a set of export incentives, opting for exchange rate adjustments for promoting export. But the gap between developed and developing states has become wider. Major share of both domestic investment as well as foreign direct investment went to already developed states. For example, out of the total proposed investment by the industrial entrepreneurs during 1991-2000 nearly onefourth (23 per cent) was for industrially developed Maharashtra, 17 per cent for Gujarat, 7 per cent for Andhra Pradesh, and about 6 per cent for Tamil Nadu while Uttar Pradesh, the state with the largest population has only 8 per cent. In spite of several concessions, seven north-eastern states could get less than 1 per cent of the proposed investment. In fact, economically weaker states could not compete with the developed states in open market in attracting industrial investment proposals and hence they are likely to suffer from these processes.